After bohemian fashion, short playsuits, trendy pants, and jumpsuits as a part of the summer fashion trend, we’ll take a look at adding some summer sizzle with the shades of yellow. Summer fashion is all about using bohemian fashion trends, short outfits, and jumpsuits. One of the trends that go perfect as a part of summer fashion is the use of bright colours. 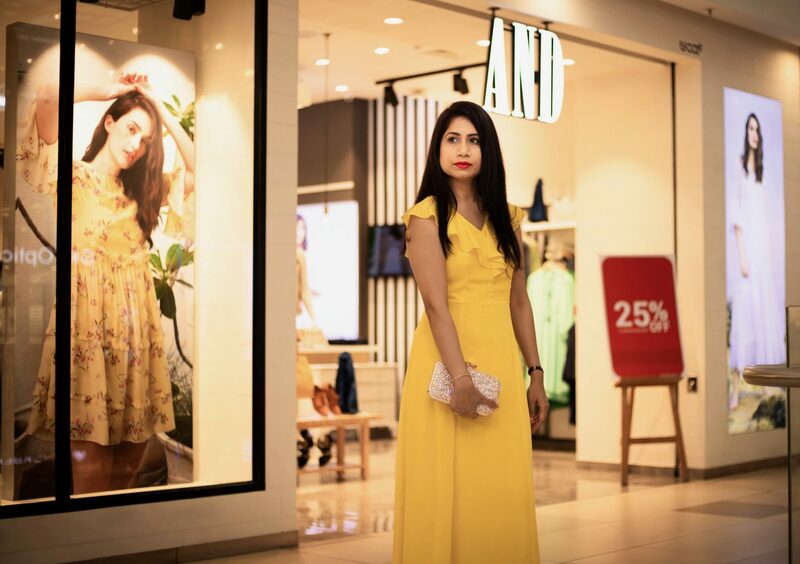 Summer is all about the bright sunny vibe we all have and what best way to style yourself than in this sunny shade of yellow? I’ve chosen a bright yellow dress that is actually a gown and I feel the colour speaks a lot without having to do much with the styling. I’ve picked a bright yellow gown from AND by Anita Dongre. As we all know, the brand offers classy and elegant collection of dresses for women. I totally love their workwear and evening gowns as well. This time, I’ve paired this exquisite design with an embellished clutch from Hamlyn Grand located at RMZ Galleria Mall. you must check this store if you are looking out for designs that are crafted with expertise and are a collector’s item indeed! The colour lends a shining joyous aura to your personality. The psychology of the colour yellow symbolises joy, optimism, happiness, sunshine, summer, gold, and is useful to create a positive approach. Flaunt the colour as this summer fashion trend and you’ll note the difference. The AND dress embodies summer fashion in an elegant way. With my Bag and footwear from Hamlyn Grande being so shiny and beautiful, I’ve opted for light jewellery from AND.